Hey, fellow servants of the Omnissiah! 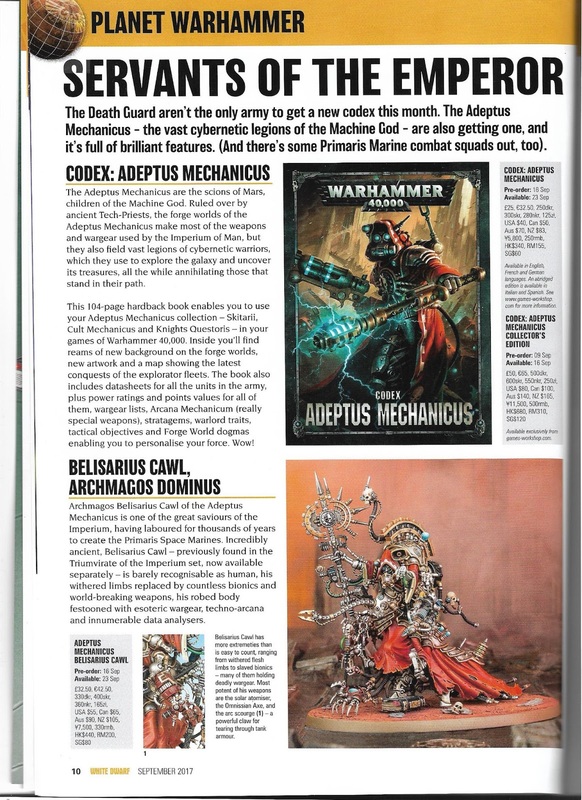 I forgot to mention that I bought the September 2017 issue of White Dwarf yesterday (or on Saturday since it's past 1am here), and with it I have news regarding the Codex: Adeptus Mechanicus! Codex: Adeptus Mechanicus will be available for pre-order on September 16th and available for sale on September 23rd. It will cost 25 British Pounds, US$40 and SG$60 (because I'm a Singaporean). Codex: Adepus Mechanicus Collector's Edition, on the other hand, will be available for pre-order on September 9th (next Saturday!) and available on September 16th. It will cost 50 British Pounds, US$80 and SG$120. It is available exclusively from games-workshop.com. What will it have that the normal edition doesn't? I have no idea. When I find out next week, I'll let you guys know. But you have to pre-order it online from the Games Workshop website. Belisarius Cawl, Archmagos Dominus of Mars, will have his own separate model. Damn it, if I had known, I wouldn't have bought the Triumvirate of the Imperium. I could just buy him on his own. Well, I already assembled him. I just haven't painted him yet. 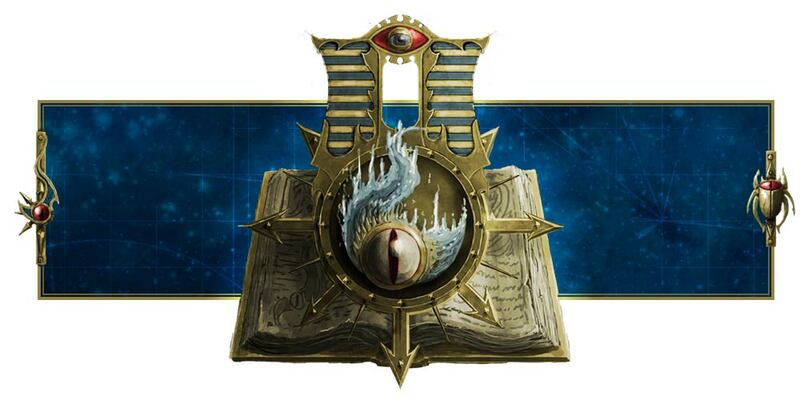 We will have Cult Mechanicus, Skitarii and Imperial Knights all bundled into one book. So yay? We have our own datacards. 67 in total, 36 tactical objective cards and 31 stratagem cards. First six objective cards are specific to Adeptus Mechanicus and include goals such as A Quest for Knowledge, A Victory for Logic and Will of the Omnissiah. Will of the Omnissiah allows us to score 1 Victory point if we randomly determine whcih Canticle of the Omnissiah was being canted this turn. 3 of the stratagem cards are from the rulebook, and we have 28 new ones. Seven of them are for forge worlds - Ryza, Mars, Metalica. No Draconis IV though, so...we'll just pretend to be one of those forge worlds and use their stratagems or whatever. And one stratagem is for Imperial Knights. The rest can be used by any Adeptus Mechanicus force, so AWESOME! Apparently one example is Gloria Mechanicus, which is "Use this Stratagem at any time to immediately change which Canticle of the Omnissiah is being canted. You can either choose a Canticle you have not already chosen this battle, or randomly select one in the usual way." Costs 2 Command Points. I can't say I like this one. I would prefer spending 2 Command Points to reuse a Canticle I have already used this battle, otherwise what's the point? I mean, I can see suddenly changing the Stratagem in the middle of the Shooting Phase or Fighting Phase to benefit your forces after declaring stuff - for example, the re-rolls to hit rolls of 1s in shooting, then you suddenly change it to re-rolls to hit of 1s in assault in the same turn. Or spending 2 Command Points to change it to Shroudpsalm right at the beginning of your opponent's shooting phase, after benefiting from the hit re-rolls, but otherwise...yeah. Well, we'll see.